No events in the ‘immediate/near future’. Please re-visit this page from time to time: announcements of upcoming events will be shown in detail here and in summary form in the ‘red banner’ at the top of our home page. As always we will be bringing together our delicious menu taking you on a trip around the world along with our delicious home made cakes and cream teas promoting interfaith dialogue! 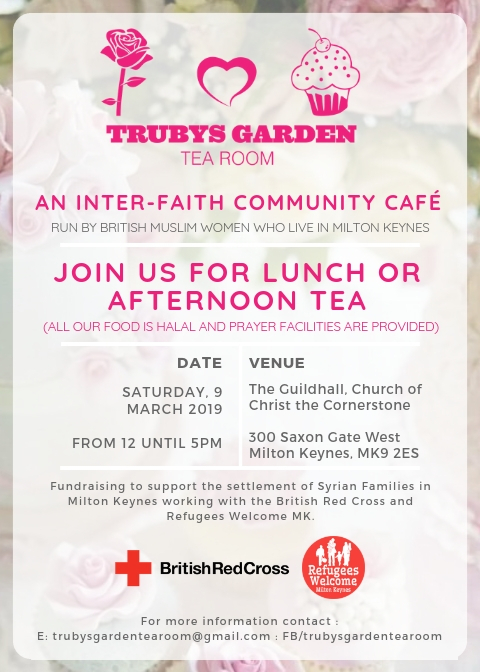 Monies raised from the event will continue to support Trubys consolidated efforts to settle Syrian families in Milton Keynes.